READING – Tonight at the oldest ballpark in the Phillies minor league system, a former World Series hero will be honored. Pat Burrell will be among the six new members of the Reading Fightin’ Phils Hall of Fame. Burrell, the former No.1 overall pick who would lead the 2008 parade down Broad Street, hit .333 with 28 home runs and 28 doubles in 117 games at Double-A Reading in 1999. Burrell came two home runs shy of becoming what would have then been just the third person in the history of the Reading Phillies to hit 30 home runs. Shortly after Burrell is inducted tonight, a fifth name could join that list at First Energy Stadium. 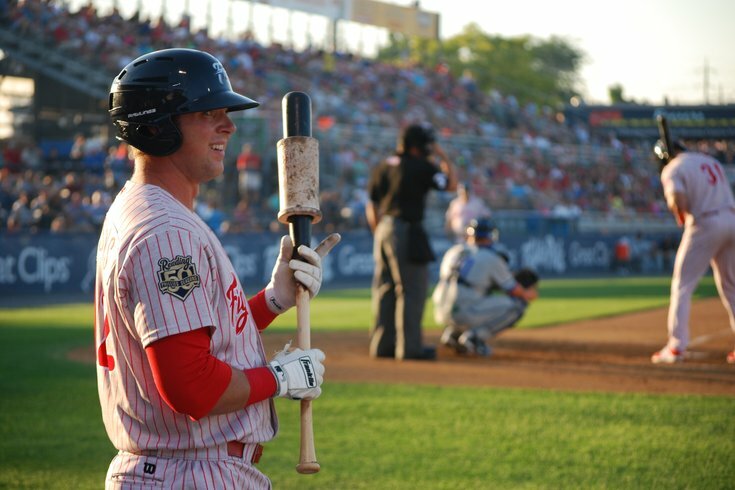 Rhys Hoskins is a 23-year-old first base prospect who just so happens to lead all minor league players with 29 home runs (in 97 games) in 2016. Hoskins, the Phillies' fifth-round pick out of Cal State Sacramento in 2014, hit 17 home runs between Low-A Lakewood and Class A Clearwater last season. But he enters Wednesday night’s game with the opportunity to become the first Reading player since Howard to reach 30 home runs before August (Howard hit his 30th home run on July 1 in 2004). Hoskins, who is hitting .288 with a .949 OPS and an Eastern League-leading 217 total bases, recently sat down with PhillyVoice for The Q&A before a recent game in Reading. He homered later that night, of course. Only two guys in affiliated baseball have hit more home runs than you, Mark Trumbo and Todd Frazier. (Updated: since the conversation, it's only Trumbo, with 30, who has more home runs). When you hear that, what do you think? Rhys Hoskins: Obviously it’s a pretty cool group to have your name thrown in there with, those guys being the big leaguers that they are. I think every kid that plays baseball dreams about their name being thrown in with big leaguers. To have that right now is pretty cool. But I try to stay here if I can (in the moment). Is there a competition with you and Dylan Cozens (the Reading outfielder who is second in the Eastern League with 26 home runs) ? Yeah, we go back and forth. I think it’s been really good for us. I think every athlete encourages competition, you know what I mean. Everyone wants to win. So I think we have a little banter that goes back and forth. If he hits one in the game, he’ll say, “Alright, your turn.” It’s kept both of us kind of light with everything going on. Instead of one guy trying to carry the load. Exactly. Exactly. I don’t think anyone feels like they have to do that, especially on this team with how deep our lineup is. I think it’s been good for the team. Jorge Alfaro has got some power chops, too. Who puts on the best batting practice show on this team? Definitely not me, I’ll tell you that. Between those two, it’s probably a toss-up. Alfaro’s probably the strongest kid I’ve ever been around. But Cozens has the light-tower power, too. Alfaro was just in the Eastern League Home Run Derby during the All-Star break, right?. Yeah, he was in the Finals. And at that place (Canal Park, home of the Akron RubberDucks) for a righty to be in the finals is pretty impressive. Because it looks like it’s a mile away to left field. I guess you're probably tired of answering questions about this ballpark (being favorable to hitters, power hitters)? Editor's note: Hoskins has hit 19 home runs in 51 games at Reading's FirstEnergy Park this year and 10 in 46 games on the road. Yeah, I mean, it is what it is. I think a lot of people don’t realize – one of the biggest things about this park is it’s really easy to see. We have a great backdrop. But it is what it is, you’ve still got to hit the ball. Just makes for high-scoring games. Like in that Futures Game here. You were one of the few people that didn’t homer in that game. But then you did homer in the second half of that home-and-home at Citizens Bank Park? What was that like? It was cool. I don’t think I remember touching the ground running around the bases. That was my first at-bat there, first of what I hope is many, many to come. It was just a really cool experience, kind of got to see what it’s like to be a big leaguer. Friends and family at that game? Yeah, my dad (Paul Hoskins) caught the last week of spring training and then drove up here for that, stayed for about the first week of two for the season. It was miserably cold but it was cool to have him there. He probably enjoyed it more than I did. It was pretty special. I did not, didn’t get the ball. Just wait and get the one when it counts. Who’s the most famous alum of Cal State Sacramento? Baseball alum. Oh ok, I was going to say Tom Hanks. Baseball – that’s a good question. I’ll let you know – Buck Martinez. Long-time broadcaster for Toronto Blue Jays. He hit 58 home runs in 17 major league seasons. Can you top that? I hope. I hope I have 17 seasons. I hope I have 17 seasons. Right, if you play 17 seasons, you’re doing something right. Back to this lineup in Reading for a second – do you guys learn from each other at all, pick up things? Well, I think me specifically that I have an advantage because I get to hit behind them (in the lineup). Especially with Alfaro, us both being right-handers, I get to watch how the pitcher is going to do to a big right-handed hitter. Especially if the pitcher has success against him, well, probably at some point during the game he’ll probably use that combination of pitches (on me). So I think I have an advantage with that, but we pick each other’s brains all the time. I think (Reading hitting coach) Frank (Cacciatore) really encourages that. More knowledge you have, the better chance you’ll have success. Is the leg kick you added this offseason the only change you made since last season, a mechanical thing that’s led to uptick in power? Yeah, I got drafted in ’14 and went to Williamsport. (Phillies roving minor league hitting instructor) Andy Tracy and I – I don’t think he does much with many of the guys that gets drafted. It’s, “Hey, I know you’re going to be tired because you’re not used to playing every day. Go do your thing and we’ll make adjustments after the season.” And when I got to instructs (after the ’14 season) I had the leg kick installed. And it’s kind of just taken off from there. Tracy was the one who told you to go with it? It was him and Joe Jordan actually. “Try to hit your knee with your chin,” they’d say. And that’s what it started as, it was huge at the start. I kind of toned it down and it clicked. That, and obviously we talk about a lot, especially at the higher level, about your approach and plan at the plate. With the leg kick and honing that every day, I think that has a lot to do with the success. 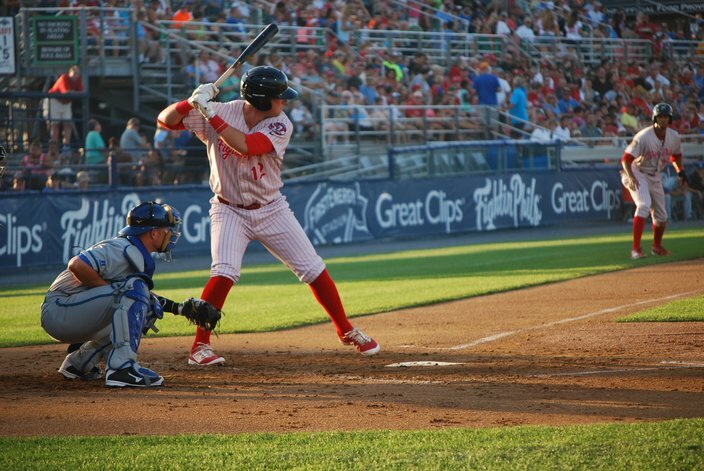 With his next home run, Rhys Hoskins will become just the fifth player in the 50 years of Reading Phillies/Fightin' Phils baseball to reach 30 home runs in a season. If you got to pick your major league walk-up song, what are you going with? I have “Three Little Birds” right now by Bob Marley. I’d probably choose “Jammin” by Bob Marley. I’ve always done reggae. I’ve never done Bob Marley until this year. Just the music you’re into, reggae? Yeah, I had a Hawaiian roommate in college, so he introduced me to it. My phone is full of reggae music now. Haven’t had that at Citizens Bank Park since Shane Victorino. What is the last movie I saw? Hmm. Central Intelligence, with The Rock and Kevin Hart. Funny. Favorite movie of all time. Wow. I think every time Wedding Crashers is on TV I’ll watch it, every single time. I also find myself watching Shawshank Redemption a lot. Any TV shows you’re into or marathoning right now? I’m currently watching The Newsroom with Jeff Daniels. I think my favorite show is Suits. Love that. I grew up watching Friends with my dad, so anytime Friends is on late (night). Laugh hysterically still and I’ve probably seen them all five times. Check out Stranger Things. Good show. Yeah, just came out a week ago. You’ve seen E.T., The Goonies? Same vibe as that. I watched them all in 24 hours. That’s not too bad, I could do that. You said Tom Hanks earlier. Would that be the celebrity you’d like to meet? I think I’d like to meet Justin Timberlake. He does it all. He sings, he dances, he’s funny, he’s athletic. Well that might be possible because his uncle (John Timberlake, the director of Florida operations and general manager of the Clearwater Threshers) runs things in Clearwater. You know that, right? Actually, now that you say that, I remember hearing that last name and someone asking. Yeah, there’s a picture there of ‘NSYNC at a Phillies game, I think a spring training game, in Clearwater somewhere. Yeah, right now I’d probably say him. Baseball-wise I’d love to meet (Barry) Bonds. Just because I grew up a Giants fan. You just missed him, he was in Philly with the Marlins. But if he’s there (on staff as Miami’s hitting coach) for a while you could get a chance. So he was the guy you grew up watching? Yeah, especially when he was going on his tear. I don’t think I missed an at-bat if I was home while the game was going on. When was his big year, ’02? I think he set the record in ’01. (Confirmed: 73 home runs in 2001). Then they went to the World Series in ’02. What grade were you in then? I was nine. Fourth grade. That’s a good way to get into baseball. It’s funny, I liked the Giants when I was a kid, too. The ’89 team with Will Clark and Kevin Mitchell. What year were you born? So I grew up with Bonds and J.T. Snow. My dad. I had to grow up a little quicker than most people did. He taught me how to be a man. I was going to ask you about that, my friend Ed Barkowitz wrote a story a month or so ago. How much did losing your mom (Cathy Hoskins) shape who you are right now? … when you’re younger you don’t get along. Nope. And now we’re texting each other all the time. Exactly. I think we talk every day, if not multiple times a day. And it kind of started with that. She’s younger. She’s 21, just turned 21 in May. She goes to school at U-C San Diego. Is she an athlete, too? Not in college. Growing up she played soccer, swam, played volleyball. You weren’t drafted out of high school, right? I played football and basketball, too, so I wasn’t doing a lot of the summer (baseball ) stuff. And I didn’t have a really good senior year. I’m happy with where I am right now. Did your dad play baseball? He didn’t. He played football in high school, went to Cal as a student and became a lawyer. My grandpa (Ray Reynolds) played his whole life. My dad introduced me to the game but I think being around my grandpa kind of watered the seed. The name Rhys. My cousin has a son named Rhys, I remember when you were drafted, telling him the Phillies were going to have a “Rhys” in the farm system. Any history with the name, since it's not all that common?